All over the world on this night, Scots will be celebrating the birth of one of our famous sons – Robert Burns. 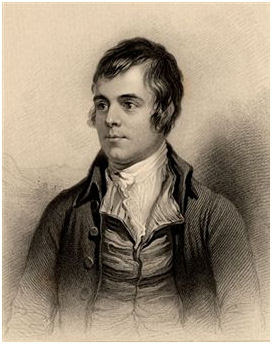 ROBERT BURNS was born on 25th January 1759 in the village of Alloway, Ayrshire near Ayr on the West Coast of Scotland. He was the eldest son of a peasant farmer. Poverty, hard work, story telling, and the Church all had a great effect on Robbie. He also had a wicked sense of humour, a great eye for detail, strong National pride, a thirst for drink and a passion for the ladies. He was fluent in French, spoke Latin and studied philosophy, politics, geography and theology and was an accomplished mathematician. His first work was published in July 1786 at the age of 27. Burns died on 21st July 1796 aged 37 at Dumfries in the South of Scotland. Burns wrote the “Address to a Haggis” honouring this noble dish. I’ve given the first two lines as the poem is six verses long! 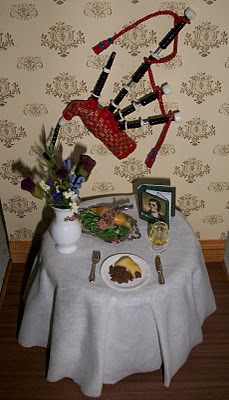 Traditionally, the Haggis is served at all Burns’ Suppers, a night of celebration (large or small) honouring the birth of Burns. A dish containing sheep’s heart, liver and lungs, minced with onion, oatmeal, suet, spices and salt, all encased in a sheep’s stomach. It is traditionally served with mashed potatoes (tatties) and turnip (neeps) and of course, a dram (a glass of whisky). The wild haggis is a furry, four legged creature native to the Scottish Highlands, whose right legs and left legs are of differing lengths enabling it to run swiftly up steep mountains and hillsides in its natural habitat. However, as the legs on the left are longer than the legs on the right, it is only able to run in a clockwise direction. *The ceremonial Haggis was purchased from Mags-nificent Miniatures and yes, in case you’re all wondering – we will be having Haggis tonight! 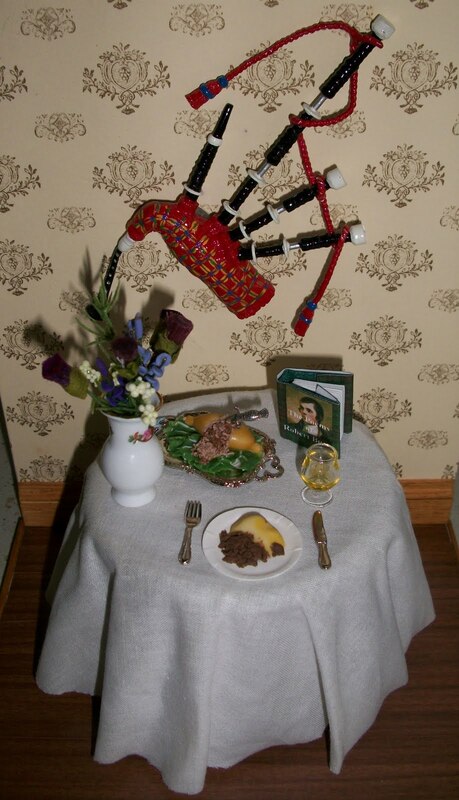 Lovely to see my Haggis in situ., Irene. Surprising how many people believe the folklore, he he. 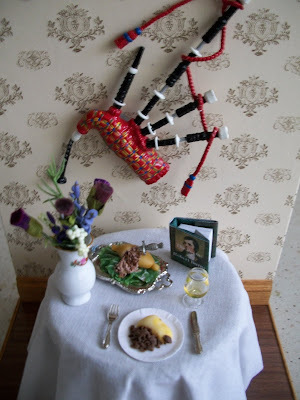 I love Haggis, have a happy Burn's night! Thank you, Irene, for this story, I love the stories they tell of ancient traditions! congratulations on the bagpipes, it is very well done! you did it? even here in southern Italy we eat the entrails of a sheep, but we cook on the coals. They are small pieces of heart, liver and lung of lamb, wrapped themselves in their guts, with parsley, salt and pepper... and accompany with good red wine! are called "rolls" and they are a specialty of my country, you think they are cooked on the road, in the summer evening. that smell! good 'Burns Night' to you! Your Scene for Burns'Night is perfect. A long time ago I was a French assistant in a private school in Glasgow and I attended a Burns' Night there. It was very interesting and a moving experience. I tasted Haggis that I enjoyed very much. Lovely Burns' Night setting! Personally I prefer not to even think about the contents of Haggis!!! Happy Burns Night to you. A belated happy Burns Night, to you, Irene! 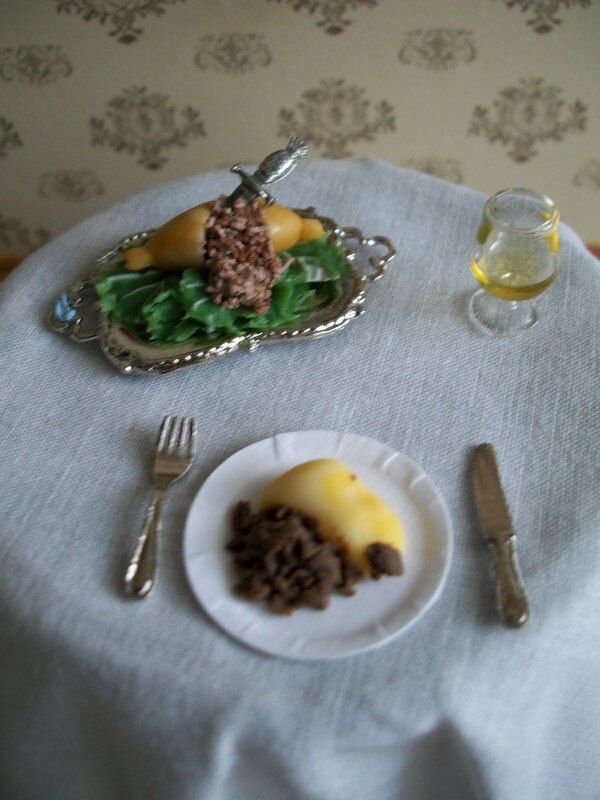 My image of haggis is of the man ceremonially stabbing it - puir wee thing!! 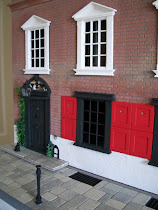 Love seeing this miniature Burns night scene. We celebrated last year but not this year. I love it when my husband reads "Address to the Haggis". His californized accent gets so much stronger! Happy Burns night. Belated happy burns night - the scene is adorable Irene (as always though). I especially like the bagpipes! It's years since I've been to a Burns night but as a bit of veggie they did me a veggie haggis!!! Thank you all for your nice comments. The haggis last night was very tasty. Not a special celebration, just a family meal. Caterina - Your "rolls" sound very similar to our haggis - I think in the past the idea was probably an early "packed lunch". It also meant that not one piece of the animal was wasted. I have missed many of your posts, including this one. Great story and scene. Love the bagpipes.